Barbra Streisand will make her first visit to Australia in March 2000 and play landmark concert events in Sydney and Melbourne. The engagements were announced today by Australian promoter and entrepreneur Kevin Jacobsen OAM and Ms. Streisand's career-long manager, Martin Erlichman. The concerts, the first ever for the artist outside the United States and London, will follow the highly anticipated Millennium concert on New Year's Eve, at the MGM Grand in Las Vegas. It was previously confirmed that the engagement at the MGM Grand would be her final concert or concerts in the United States, but the artist said today she had long wanted to fulfil a lifetime dream of performing for her Australian fans. It's estimated that the cost of mounting the concerts was in the range of $9.4 million-$13.2 million U.S. dollars. Billboard and Jacobsen Entertainment confirmed that the profits of the concerts were split 90/10, with Streisand getting 90% of the revenue and Jacobsen getting 10%. Barbra brought Marvin Hamlisch and the other original cast members with her to Australia (minus Savion Glover as Brother Time). Venetta Fields, who was in A Star is Born with Streisand as one of the Oreos—and who lives in Australia—joined Barbra onstage as one of her backup singers during the concerts. Australian celebrities like Nicole Kidman and Olivia Newton-John attended the concerts. 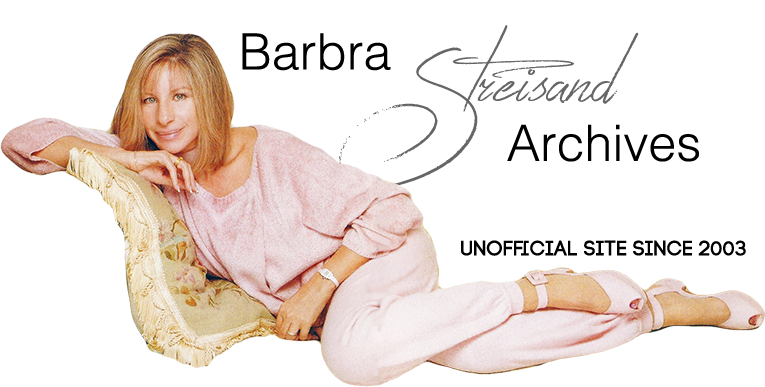 Australian fans were able to purchase a handsome, full-color, 11 x 14-inch tour program with loads of rare photographs of Ms. Streisand—similar to the programs sold in the U.S., but with a different cover photograph. Barbra Streisand and James Brolin were expected to arrive in Sydney on March 4 via Air New Zealand and were originally to stay in a private harborside home. Reportedly, they had previously spent three days at Taupo, New Zealand's Huka Lodge. On Feb. 27 the Sydney Morning Herald featured a full-page ad announcing the opening of a "Barbra Department" in the David Jones store located on Elizabeth Street in Sydney. Before closing in the weeks following the concerts, the store sold "specially designed merchandise commemorating her Australian tour, such as the tour program, "Barbra's favourite plush toys," and embroidered t-shirts. At 5:00 p.m. AEDT (Sydney time), Promoter Kevin Jacobsen held a press conference outside Sydney Football Stadium to announce that the evening's March 8 Barbra Streisand Timeless performance would be postponed until March 9 because of rain. Under such conditions, he said that the safety of the public and the production and technical staff left no other options. He relayed Streisand's disappointment and belief that safety for all concerned was of paramount importance. In a radio interview Barbra's manager Marty Erlichman said it was felt that the wild wind and rain made conditions both in the stands and on stage too dangerous to proceed tonight. "Barbra's heartbroken," said Erlichman. "She's come half way around the world to perform for her Australian fans." “Thank you for coming, almost, last night and for coming back tonight. Thank you so much!” said Barbra Streisand on March 9th to a reported 28,000 in the open-air Sydney Football Stadium for her first-ever concert outside the U.S. and England and the very first since two consecutive nights in Las Vegas for New Year's 2000. "Isn't it a beautiful night? It was worth waiting for," Streisand added, after being disappointed along with everyone else the previous night when the opening of her two-night stadium stand was rained out. Wearing the shimmering Act 1 pantsuit costume she debuted in Vegas, Barbra admitted that her voice had been working hard lately. "My voice is a little hoarse, I hope you'll excuse me," she requested, following a splendid rendition of "Alfie." "But, I was rehearsing in the rain for two nights and got a little scratchy (cough, cough)." Most didn't notice. Her "The Way We Were" performance was excerpted on U.S. TV (Entertainment Tonight), nearly identical to the clip ABC screened on New Year's Eve. Arriving as early as 5 p.m. for the 8:00 show (delayed for 30 minutes as people continued to make their way through metal detectors and bag searches), audience members wrapped themselves in woolen clothes and rain gear to protect themselves during the evening. However, the weather was perfect. Fans reporting on the show have expressed nothing but delight with Barbra's performance. Just before "Don't Like Goodbyes," as people were yelling out various greetings and song requests, Barbra asked if this was the "audience participation part, talk amongst yourselves kind of thing." Surprised and taken aback for a moment, she replied, "I never took requests. When I was a kid 18 years-old in the nightclubs, people would yell out things. I'm gonna sing what I'm gonna sing, ya know?" At the stadium following the show, the Sun-Herald reports, "An excited group, including Premier Bob Carr, Major-General Peter Cosgrove, cinematographer John Seale, and media figures Ray Martin, Mike Munro, and Stan Zemanek waited like bashful schoolboys before being welcomed into the singer's suite." Below: Australia news reports about the Streisand concert. March 10th in Sydney was a particularly memorable concert because it rained. “I've been singing 'Don't Rain On My Parade' for 35 years, and it's worked up until now,” Barbra said from on stage. By the end of the first act, the rain was falling onto the stage in sheets from the set's "roof" and Barbra donned a jacket matching her pantsuit. A stagehand spent the entire intermission mopping the stage while others wiped down parts of the set. The audience, which had stayed on the covered "concourse" level corridors until right before the show began in order to keep dry, pretty much stayed glued to their seats during intermission despite the downpour. For the second act, Barbra donned an Akubra hat and wore a black athletic outfit. How Did This Show Vary From Las Vegas? Backing vocal personnel changed in Australia. Venetta Fields (sang frequent background vocals on many 1970s Streisand recordings and played one of the Oreos in A Star Is Born; now lives in Australia) joined Barbra's two Australian female background singers, featured prominently for "The Main Event." Also, the show's choir was composed of 87 Australians - Sydney Children's Choir and Sydney Philharmonia Choir - who performed downstage, instead of on the top tier during "At The Same Time." Songs omitted (Sydney & Melbourne): "Miss Marmelstein," "Speak Low," "Simple Pleasures," "Crying Time" (duet video excerpt), "Friends" solo, and Vegas overture (replaced by the familiar 1994 overture). "As Time Goes By," less than 1 minute long in Las Vegas, was extended to 2 minutes in Australia in the absence of "Speak Low." The "Moonlight and love songs..." verse and final chorus were added but not repeated as on Barbra's original 1964 studio recording. "Auld Lang Syne," sung in two parts in Las Vegas, was consolidated in Australia. Monologues and content customized for the show's non-New Year's setting and Australian audiences: Shirley MacLaine dialogue abbreviated; "Mom" offered Barbra a meat pie in addition to a sandwich; Barbra made references to the country and upcoming Summer Olympics; and she toyed with an Australian accent at times and well-known Aussie words like "mate." A "Time Wizard" (not played by Savion Glover) danced to open Act 1 but virtually nothing more. On 3/10 Barbra introduced Olivia Newton-John in audience, calling here "Livvie" and thanking her for being so supportive in efforts to receive Malibu building permits. The "Clickers" poem, placed directly before "The Main Event," was significantly shorter, starting with "Nowadays..."
Etc: As in Vegas, Lauren Frost played the pre-adolescent Barbra, and, surprisingly, the audience received new Duracell commemorative "Australian Tour" flashlight wands. Other concert souvenirs which were on sale were not redesigned for Australia. The heavy red and gold velvet curtains remained drawn above the stage, Barbra explaining that the curtains kept blowing and distracting everyone during rehearsals. Barbra Streisand and James Brolin arrived in Melbourne Monday evening, March 13, following a drive originating in Sydney on the Princes Highway along Australia's east cost. Streisand's set designer, David George, spoke to the Herald Sun newspaper about the red carpets backstage: “It's because the set is a maze,” he said. “It's three stories high and very much like being in an inner pyramid with all the tunnels and the turns. So we can follow the red carpet to her entrances backstage. Otherwise you'd get lost. “Barbra actually has a number of dressing rooms,” George continued. “Backstage, we have quick change rooms for her, way backstage are her personal dressing rooms, where she does all her make-up herself, and then we have a large dressing room called the salon where she receives special guests. Newspaper clippings below courtesy of Anthony Lucca, from his collection. Jacobsen Entertainment placed a full-page thank you message to Barbra in Billboard's May 13, 2000 issue. In addition, on its Web site reads the the following: "Jacobsen Entertainment presented Barbra Streisand in the only concerts outside of the US and her London appearance in 1966. The four concert appearances achieved the highest gross of any in the world. The Barbra Streisand appearances in Australia proved to be landmark events both artistically and financially." In fact, box office returns totaled AUS$34 million, with about AUS$30 million going to Streisand, and the veteran promoter clearing AUS$2 million in profit. Barbra used a large portion of her fee to finance virtually the entire Timeless production, including the cast, its production and tour staff of over 300 people, a 78-piece orchestra, and locally hired choirs. Her technical backup sported a very large LED screen, TelePrompTers, a tri-level set, and a 250,000 watt sound system estimated to cost more than AUS$10 million alone. Credits for this page: Many thanks to Mark Iskowitz for sharing set lists and concert details; I've borrowed heavily from his Barbra Streisand Music Guide Timeless pages—with Mark's permission.